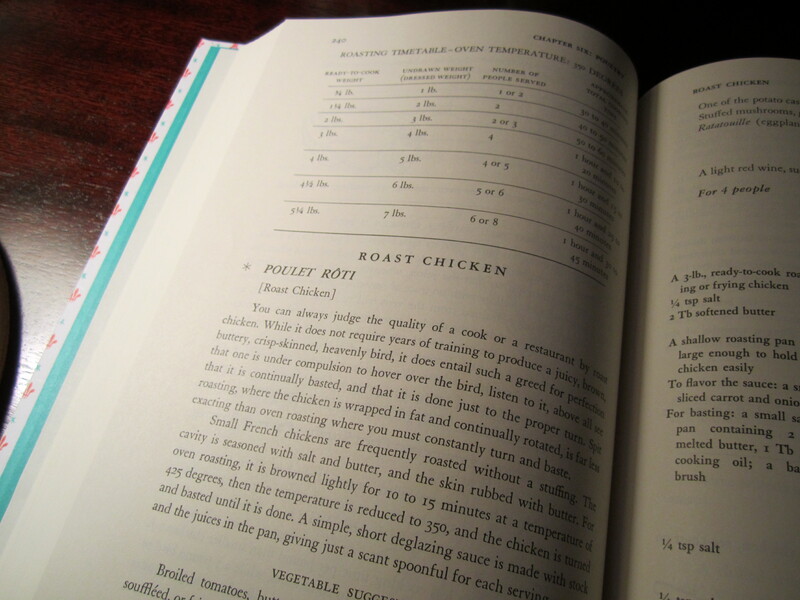 Perfectionism and Poulet Rôti « I'd rather be in France. Julia (Child) says the best way to judge a cook is by his or her roasted chicken. 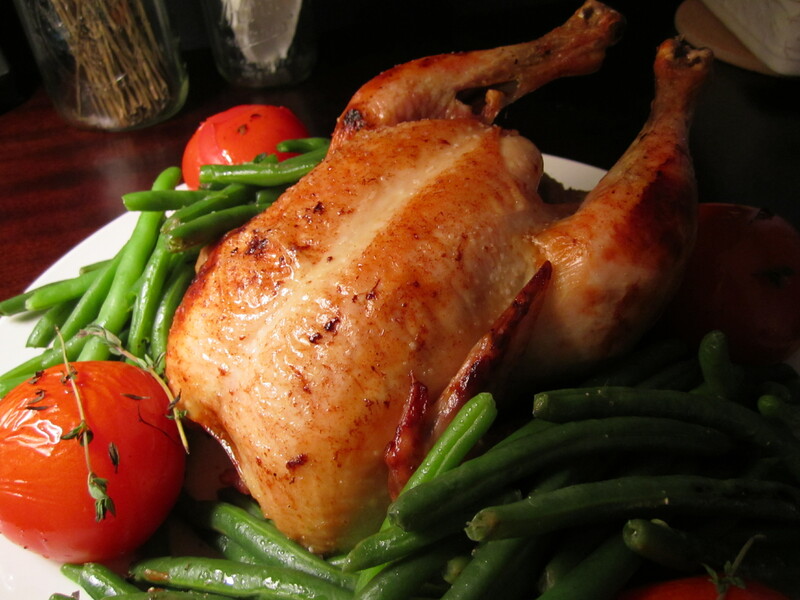 Sure, there are other ways of cooking chicken, like wrapping it in bacon and cooking it rotisserie-style (ummm….yum), but those ways doesn’t require anywhere near the level of oversight as poulet rôti. Julia says it takes a true perfectionist to get it right. You have to hover over it, basting it every 8 or so minutes, and the way to know it is done is by the sounds it makes. I guess you could say I am a bit of a perfectionist. I particularly enjoy projects that are detail-oriented and that put my obsessive nature to good use. This is probably why baking was such a natural creative outlet to pick up while I was in law school. I first dabbled with cake decorating, but quickly grew bored with making cakes out of a box. Next were cookies and cupcakes, the crowd pleasers. But when that wasn’t enough, I switched to pies. Pies combine the art of pastry-making with the endless possibilities of cooking fruits, custards, and creams. Even though I am used to dealing with finicky recipes, I was nervous about attempting the simple dish of French roasted chicken. 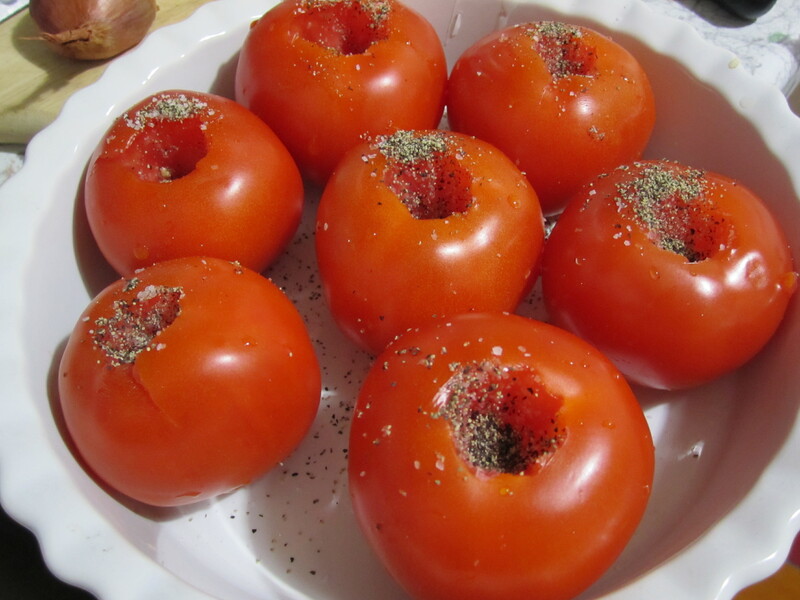 I thought about making it my first dish because it is one of my all-time favorite things to eat, but I got scared I wouldn’t do it justice and my infantile run as an amateur French cook would come to an abrupt halt. Instead I made the more forgiving boeuf bourguignon. You see, there is a part of me that believes I can get most things right on the first try. Call me egotistical — or at the very least overly sure of myself — but I’ve never started a project I couldn’t finish and I’ve never met a recipe I couldn’t make. 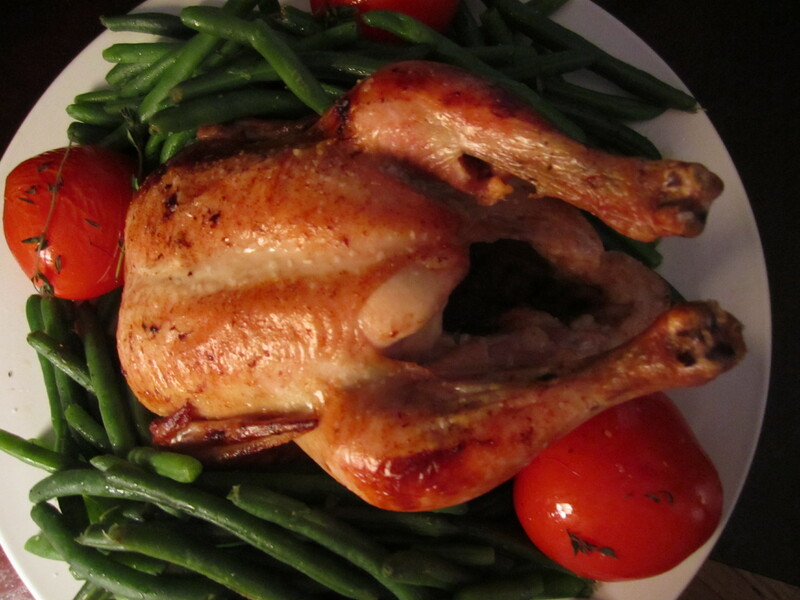 When it comes to French roasted chicken, however, that part of my brain was strangely quiet. It was only with great hesitation that I forced myself to attempt this dish this past Friday night. The other reason I chose this endeavor for this particular evening is the cook time was only an hour and twenty minutes. 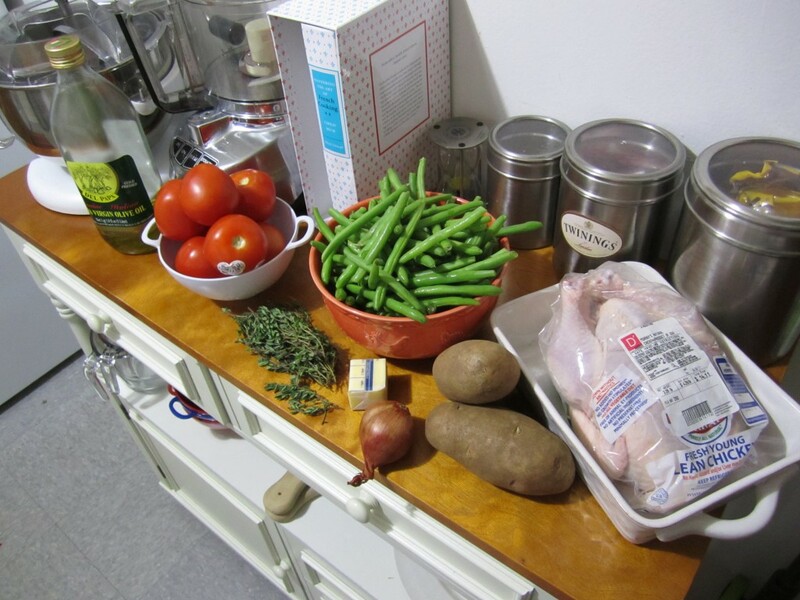 Even with a full day of work, there would be plenty of time to stop by the grocery store and cook in order to have dinner ready at a reasonable hour for my two dinner guests who so kindly agreed to be my guinea pigs. I was about five minutes into the recipe when I realized I overlooked the part in the recipe calling for a carrot and an onion to flavor the chicken. So, with the oven and chicken ready to go, I ran out the door to the grocery store around the corner. Buying groceries in the city can be expensive and heavy, but nothing beats beings able to run and grab a few forgotten items from the store and getting back before the end of the next song on the playlist. Although I ended up with all of the correct ingredients, I still took one shortcut…. I didn’t truss my chicken. According to the instructions, I am supposed to use a mattress needle to sew up my chicken into a neat, tight bundle of poultry. I don’t even have string to tie Ms. Poulet’s legs together, much less a six-inch needle. Julia claims this is done for presentation’s sake, so I skipped over the trussing instructions and focused on the salting and buttering. 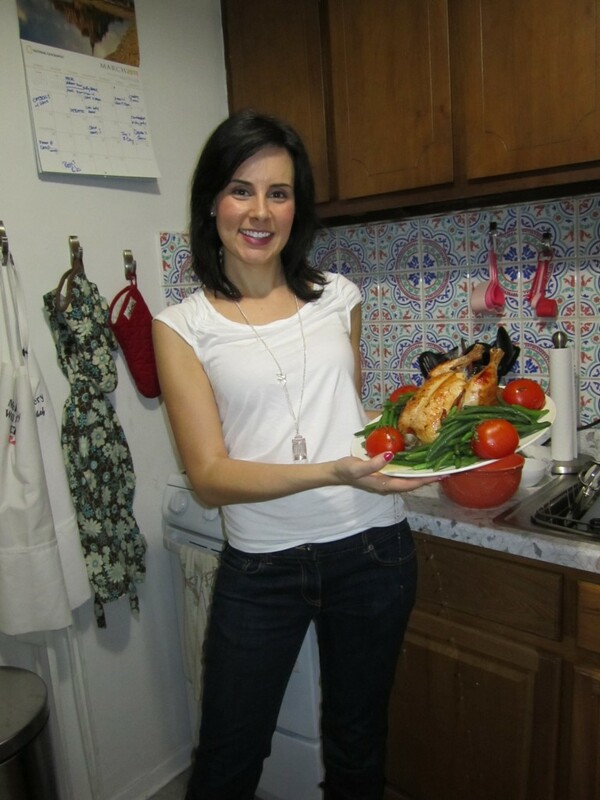 Julia’s recipe for roasted chicken is simple. A little bit of salt and layers and layers of butter. You have to constantly babysit the bird, basting it every 5-8 minutes. Sounds like a pain, but I assure you the hovering is worth it. To accompany this dish, I repeated Julia’s buttered potatoes and added roasted tomatoes and buttered green beans. In the end, the chicken wasn’t perfect. I was running behind schedule, and I quickly learned that trying to entertain guests and cook a French dish for the first time isn’t easy. Between listening to the chicken and listening to my friends’ stories, I chose the latter. 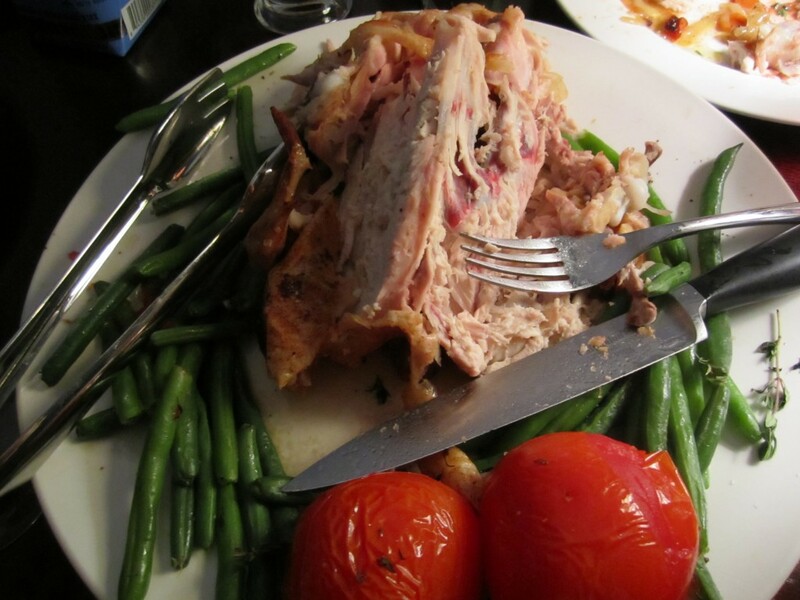 Perhaps as a result, the chicken ended up far from crispy, although the inside was still moist and delicious. 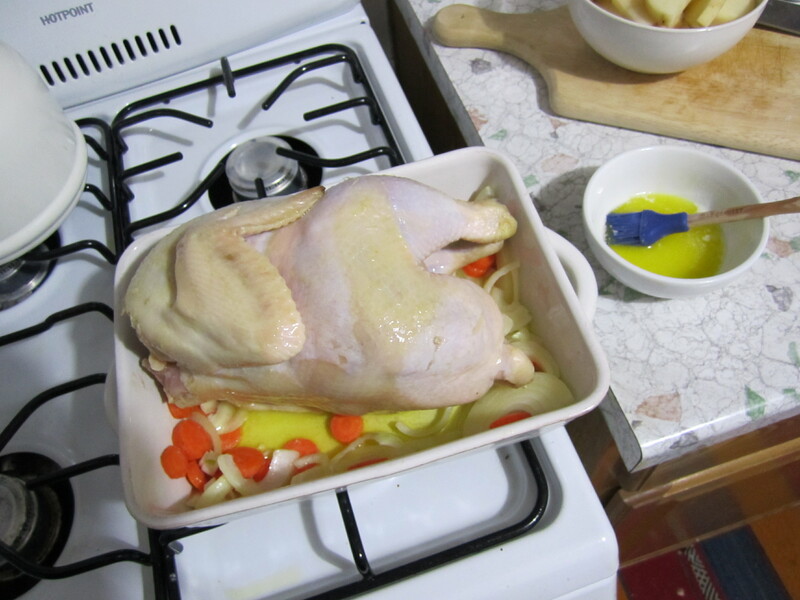 Crispy or not, we devoured the 3-pound bird, and the stripped carcass is now sitting in my freezing waiting to be turned into chicken stock. I give myself a C+ on this one. I am going to have to do some research about chicken skin to figure out why mine wasn’t crispy. I suspect my oven is not as hot as it should it. Also, I was paranoid about ended up with dry chicken (what greater sacrilege could there be than a dry chicken? 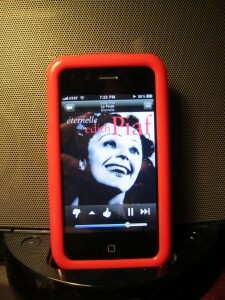 ), so I took it out probably ten minutes too soon. But, like I said, it was still delicious. 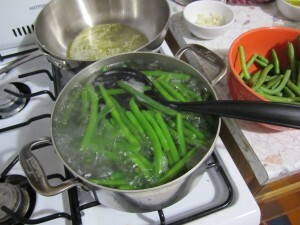 This entry was posted on April 4th, 2011 at 1:44 am and is filed under La Cuisine. You can follow any responses to this entry through the RSS 2.0 feed. You can leave a response, or trackback from your own site. Having been fortunate enough to try this chicken, I think it was absolutely delicious!